In case you hadn’t guessed by now, I’m frantically using up some quail eggs I had forgotten about in the fridge. The last time I was at Marukai, I bought two packs, intending to use them in a lot of different lunches. In the end, things just didn’t work out. I’ve got just a couple more left, which should be enough for just one more bento, though I don’t know what theme it’ll be yet. 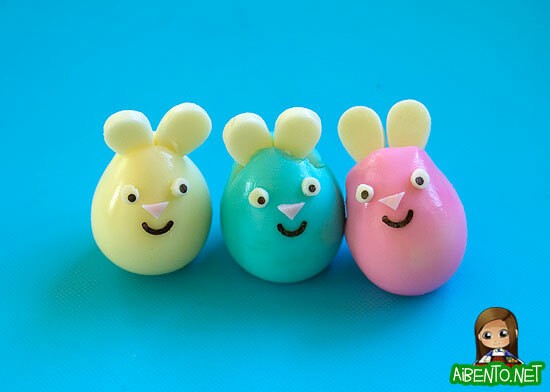 Yesterday I made a trio of Easter bunnies, one blue, one yellow, and one pink. They all have cheese ears and eyes, along with fish sausage noses. Let me introduce you to them before they go into my lunch! They’re all smiley and happy. Pink bunny is leaning in for a nice pose. I ended up taking the smiles off as they didn’t quite look right with the mouth once I added the whiskers, which is little pieces of raw somen noodle. And yes, I realize they look like mice. 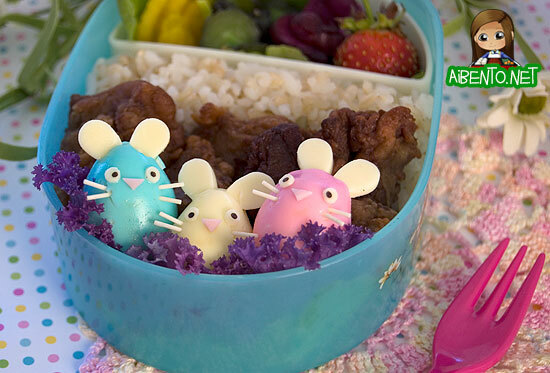 🙁 Easter Mice Bento? The trio from another angle. They’re in a patch of purple kale and snuggled against some leftover mochiko chicken and hapa rice. In the side container I have three types of pickles: takuan, kappa zuke, and eggplant pickles. I added one small garden strawberry for some red. 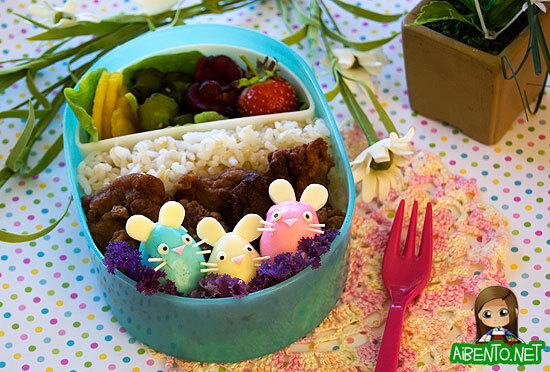 Find cute bento boxes and supplies at Japanistic!